The Crossness Pumping Station mid-restoration, 2009. Photo via Getty Images. 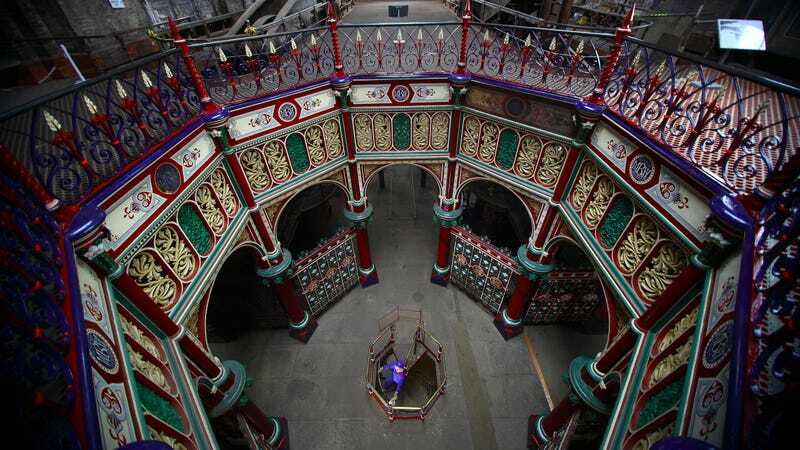 What you are seeing is not some fancy theater or place of worship, but rather the Crossness Pumping Station, part of London’s ambitious Victorian-era sewer system, which is now open to visitors. Only the finest, most ornate repositories for the turds of the Victorians! But in 1865, engineer Joseph Bazalgette unveiled a complex new modern sewage system, which used steam engines to pump the capital’s waste into a 27 million gallon reservoir - enough to fill 49 Olympic swimming pools. The sewage then remained in the reservoir, concealed from the public, until high tide, when it was released into the Thames and carried out to sea. The steam-powered above-ground pumping station, built in Bexley, south-east London, successfully solved London’s foul stench, and continued to pump waste away from London for almost a century. Designed in Byzantine style with hints of Moorish influence, these ornate cathedrals of waste held steam pumps surrounded by red-brick arches, octagonal cupolas, shiny brass handrails, wrought-iron detailing, and elegant “MBW” monograms—for the Metropolitan Board of Works. At Crossness, the steam pumps were named Victoria, Prince Consort, Albert Edward, and Alexandra, after members of the British royal family. Visiting hours look a bit spotty, so check before you embark, but if you time it right you can even catch a “public steaming day” to see one of the original engines in action.